In Hong Kong, I am what is known as a “trailing spouse.” What this means is that my husband is the one with the job that brought us here, and I am the tagalong “dependent,” my official label. His entry was sponsored by his employer, and mine was sponsored by my husband. So that I do not have to exit and re-enter the country every three months to refresh my visa, we applied for my Hong Kong ID card soon after I arrived. My husband was born here, so he already has one (with three stars) as well as a US passport. To get my ID, the two of us visited the immigration office where we signed the requisite paperwork—me to request permission to stay and him to be my guarantor. A bit like having to have a parent’s signature when you are underage and not earning your keep. In fact, we lined up alongside several sets of parents signing for their children. A few weeks later, we picked up my card. I’m officially a Hong Kong resident. No stars, but official. If I stay for seven years, I can apply on my own merit. Like a grown-up. 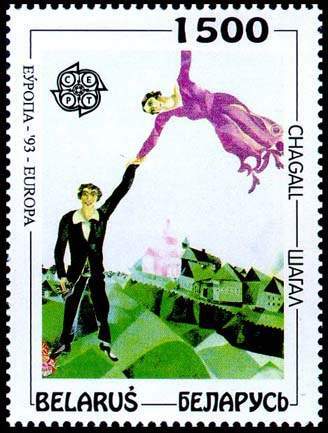 The label “trailing spouse” always reminds me of a painting by Marc Chagall called The Promenade (excerpted version shown here on a Belarus stamp because I am not sure about the copyright). Standing just left of center in the actual painting is an exuberant young man with his left arm outstretched. Attached to that arm is his wife, who flutters overhead and off to the right like a pink scarf, her left arm extended outside the frame. The painting depicts Chagall and his wife Bella in the first years of their marriage, but what strikes me most is this: The husband has both feet on the ground and the wife has only a handhold between her and the great beyond. Without him, she is a kite or a helium balloon about to rise. Before I moved across the Pacific, I was amused to see that therapy figured high on the lists of resources for expats. I get it now. During the four months between when my husband moved from Honolulu to Hong Kong and I did, I was a powerhouse of independence. I oversaw repairs and bought a new washer for our condo. I cleaned, staged, and sold our condo. I sold our car and furniture. I shipped our cats and sorted, packed, and shipped our belongings. I shopped for supplies and got myself to Asia with five heavy suitcases. And then I arrived in Hong Kong—downgraded to a dependent. This move has entailed plenty of dependencies that are circumstantial and unrelated to my marriage. Where I used to hop in my car and drive to a store, I must now take a shuttle, a train, and a subway to get just about anywhere from where we live on campus in the New Territories. And I am more tech-dependent than ever before. I’m not good with directions, so I need Google maps to get around. I’m not good with numbers, so Google is my best friend for figuring out the exchange rate so I can shop, metric measurements so I can cook, and centigrade vs. Fahrenheit so I can dress myself appropriately for sun or showers. My Google dependency makes me dependent on my phone, so I fit right into an environment where the majority of the public are looking at their phones at any given moment. As for the other kind of dependency, at first I was too busy to dwell on it. I set up house, finished teaching my last online course, and finished a draft of my memoir. This isn’t my first time in Hong Kong—my book is about that experience—so I’m over the initial culture shock. Still, I don’t speak Cantonese, and I don’t know my way around, so I expected to be semi-dependent on my husband for translations and directions as well as cultural interpretation. I can only imagine how lost someone new to the country, with no connections or cultural guidance, might feel. And I can imagine the kinds of stress it could put on a relationship. The man who married an independent woman suddenly has a sobbing child on his hands on top of a new job. The woman who thought she had an equal partnership now feels small, diminished, resentful of his projects, obligations, long hours at work. It is hard to hang on to each other when your hands are full. Like many trailing spouses, I am discovering that while the person with the job has to deal with the usual stresses of the workplace, they also have a built in place to go, daily social interactions, a schedule, and a to-do list. Often one so long that it adds to the loneliness of the person who came with them on this adventure. The trailing spouse has to invent a life. All of it. Before I arrived, I was looking forward to enjoying unlimited writing time and hoping to find a community of like-minded women. So far I have managed the first but not the second. In the meantime, I am the extra at his events, dependent on his colleagues, family, and friends for social interaction. It gets me out of my pajamas and away from my desk. I meet interesting people and I love my husband, but I miss my friends. I can’t speak for every trailing spouse (and I should point out that they are not all female), but for me the challenges of being a trailing spouse and being a dependent are distinct as well as linked. My resistance to dependency is an issue I, like many feminists, have been working on all my life. Much of my writing about my Chinese family is about my discovery that interdependence doesn’t have to compromise my sense of independence. That’s my talk. Now I get to walk the walk. As for the trailing challenge, here are my proposed personal solutions. As the one with time on my hands and a new world at my disposal, I am committing to trying to bloom where I am planted. That means exploring, Google maps in hand, alone if I have to. And if solitude is what I am being dealt right now, then I suspect I need to embrace it. I can consider it an extended writing retreat if I stay home and solo travel when I go out. I just might meet some fellow travelers along the way. The important thing, I think, is to anchor myself by more than just one hand, to more than the person on the ground. To be the wind and not the blowing scarf. Remind me of this when I start whining! This is a wonderful commentary on dependence, interdependence, and personal growth. Thank you for sharing. Nothing like “Trailing Spouse” has happened to me, but I love that you are a force in the wind and not merely a kite. Lovely. At least that is my goal! Thanks for reading. I love what you wrote. And, I can totally relate to your feelings. I see you as very brave. I look forward to hearing how you break out and go! Miss you my friend! Cheryl D.
Well, you know me well enough to know that I always say that there is a fine line between bravery and ignorance :-)). I still see myself falling off cliffs more than jumping. I really enjoyed this. Made me think of my aunts who followed their husbands to many foreign places while in the service. It is, or at least was, mostly women who were the “Trailng Spouse”. You are an amazing writer. Thanks, Denise. I have thought so much about my grandmother’s journey in the course of writing my memoir and now in moving to a foreign country. And back when our ancestors were moving from place to place, there were only letters to communicate as well as the certainty you would never go home again. Hard to imagine. I remember my time as “dependent” very clearly. Especially the day I first went out on my own. I have been waiting for it, as my resentment is more the actual trailing the husband up and down escalators, in and out of buses and trains and never having the time (as he was a fast walker) to look at the signs for myself. I just loved getting to know my new town (Hong Kong Island). In the end, or actually long before the end, I knew nearly all of Hong Kong like the palm of my hand. I still miss it and I am looking forward to seeing you there! Much love. I can’t tell you how much this helps me to know you once experienced this as well. When I met you, you had a confidence I thought I would never achieve (still working on that!). I totally get the part about following someone around not helping you learn to navigate!